Take Plaine Products with you wherever you go. Eliminating the need for little plastic bottles, these travel size can be refilled with our 16 oz products. We’ve combined a warm citrus scent with lavender to help you wash away stress. Our shampoo’s vegan ingredients will gently bring your hair back to life and restore manageability, adding sheen and softness from ends to roots. Our shampoo is suitable for all hair types. Enjoy the luxurious non-toxic lather, it’s a choice that’s good for you and the planet. 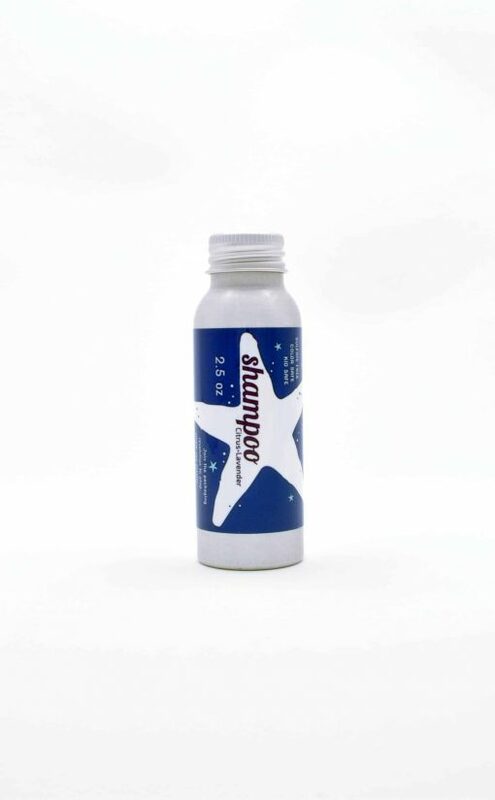 Includes 2.5 oz of shampoo in reusable aluminum bottle. The travel size is just perfect for traveling. They make it so easy to take my favorite Plaine Products with me. I ordered the travel size because I wanted to test the products before committing to the full size, and I have to say I am pleasantly surprised. I really did notice an improvement in my hair – it was shinier, more full-bodied, and smelled lovely. I am traveling for a while, and very pleased to have these to take with me, and I will order the full size versions when I return. I bought this size shampoo and conditioner as a trial before I invested in the large one and boy I am happy I did!! I can’t tell you the amount of zero waste shampoo and conditioners I’ve tried and didn’t like! Thank you so much Plaine Products for providing me a zero waste alternative that doesn’t feel like an alternative! I already have my full sized bottles on the way!! Glad I got the travel size to try because my scalp reacted so badly to this shampoo. I have a very sensitive scalp and the only thing that has tamed my itchy redness is head and shoulders. But I really want to create less waste and am trying to use more natural products. I LOVE what this company is doing. Unfortunately even after sticking through the entire bottle my scalp is back to being an itchy mess. Might try the rosemary one to see if it was the citrus that may have irritated.